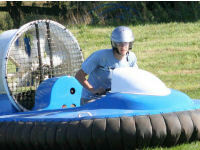 This is the chance for you and your friends to have a go at the exciting sport of Hovercraft Racing. Includes training, practice session and one timed lap. Suitable for total beginners. Voucher valid for 6 people. 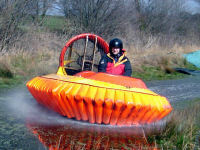 This is the chance for you and a friend to have a go at the exciting sport of Hovercraft Racing. Includes training, practice session and one timed lap. Suitable for total beginners. Your chance to have a go at the exciting sport of Hovercraft Racing. Includes training, extended practice session and several timed laps. Suitable for total beginners. Your chance to have a go at the exciting sport of Hovercraft Racing. Includes training, practice session and one timed lap. Suitable for total beginners.